If you’re wanting to experience urban RVing and are looking for RV parks near New York City, Liberty Harbor RV Park is the place to be. 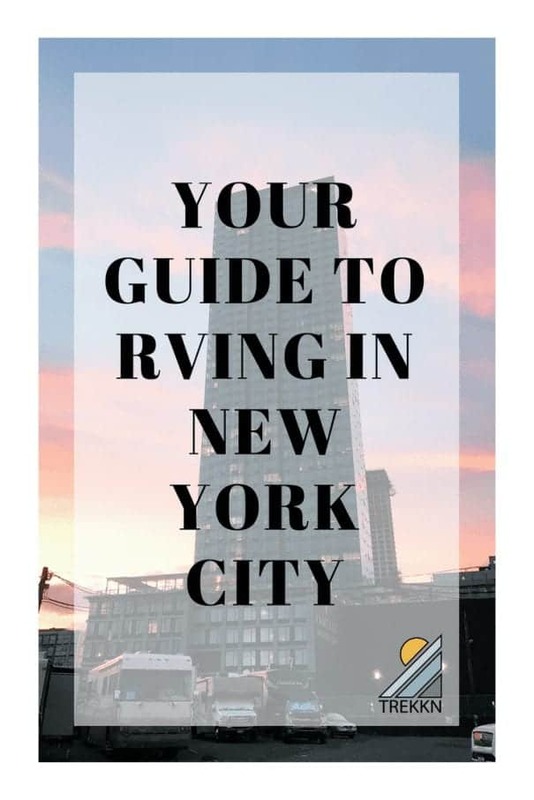 With its fantastic location, great views of the Statue of Liberty and staff that are nice enough to help you understand the subway system, you are sure to have a wonderful city experience. Check prices and availability at Liberty Harbor RV Park here. How Did We End Up In Our RV in NYC? 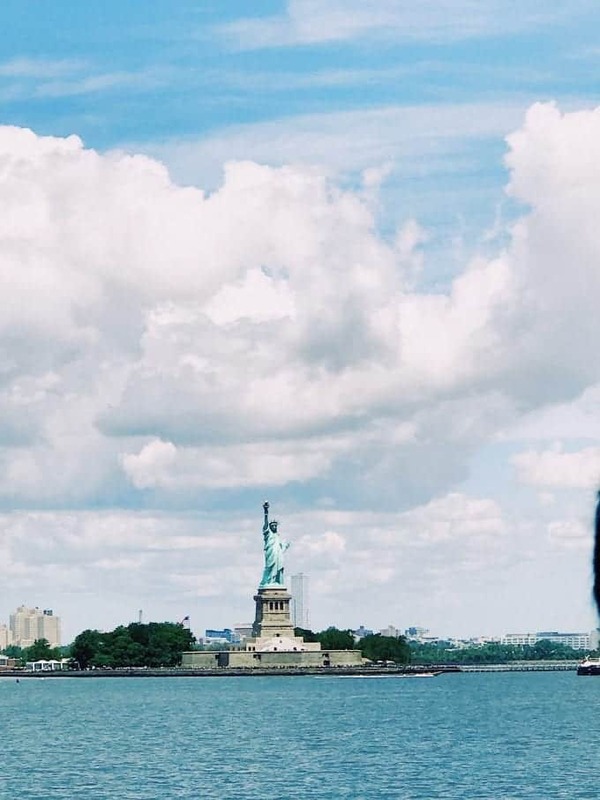 For our second summer of full-time RVing, she asked if it was possible to make it to New York City, the city she has dreamed of visiting since she can remember. What was our response? Heck yeah, we can! Since she’s only with us in the summers and on her breaks, we like to try to to get her places she’s been dying to visit. 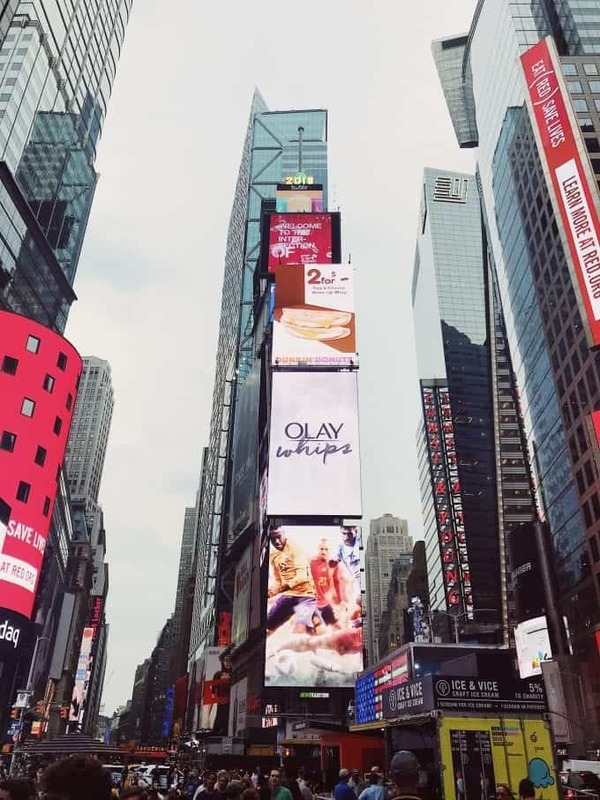 We knew we wanted to be as close to the city as possible and not have to drive our long bed truck into the city, but instead, walk and take the subway. So Todd set out on a search for RV parks near New York City, which led him to Liberty Harbor RV Park in Jersey City, New Jersey. This wasn’t our first rodeo with urban RVing, so we kind of knew what to expect. Last fall, we RVd in San Francisco and it was so much fun. We were able to catch an Uber or Lyft into the city, while our truck stayed safely by our RV. Check prices and availability for the San Francisco RV Park we stayed at here. 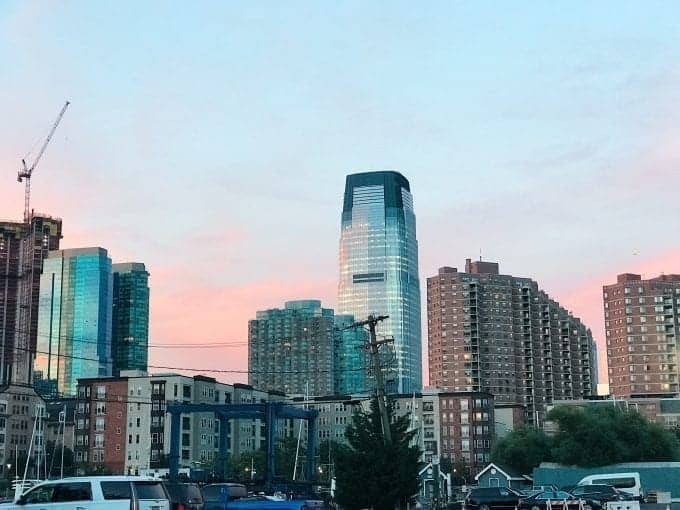 While we knew a little about urban RVing, we had no idea just how perfect a location this RV park in Jersey City was. But before we got there, we were pretty much going in blind. We had questions like what’s it like driving in the city to the park with our travel trailer and what’s the subway situation like and is the RV park noisy? So.many.questions. We’re thinking you just might have some of the same questions we did, so here’s our guide to RVing in New York City. Enjoy! Is urban RVing more expensive? For us, it most definitely was. Since we’re a member of Thousand Trails, we stay at those RV parks as much as possible, but sometimes there’s not a Thousand Trails Park in the location we want to be in. So we have to pay. When Todd told me Liberty Harbor RV Park was $100 a night, my jaw fell to the floor. This was the most we had ever paid and I was questioning if it would be worth it or not. But when we looked at our other options, like staying at a park farther away or storing our RV and booking an Airbnb, this was the best decision in the long run considering both cost and convenience. So we booked five nights and crossed our fingers we made the right decision. We knew getting to the RV park meant driving through the city. Not New York City, but narrow and crowded city roads nonetheless. Yes, the roads were small. Yes, it was a tight squeeze. Yes, the roads were bad with potholes and rough roads galore. No, it wasn’t dangerous. 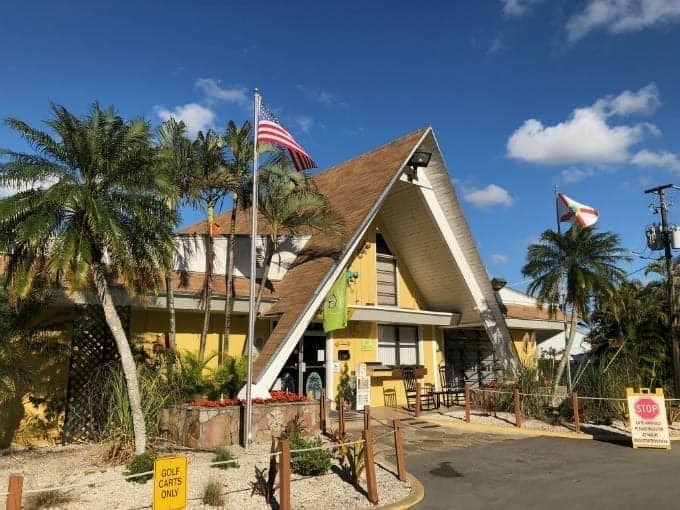 Liberty Harbor RV Park has no sewer connections, but they do have a dump station on site as well as full bathroom and shower facilities. They also have water and electric. It’s always a little tricky for five of us to stay at a place without sewer for longer than a few days, but we knew our worst case scenario would be having to hook up and pull around the corner to empty our tanks one time during our five-day stay. No big deal. 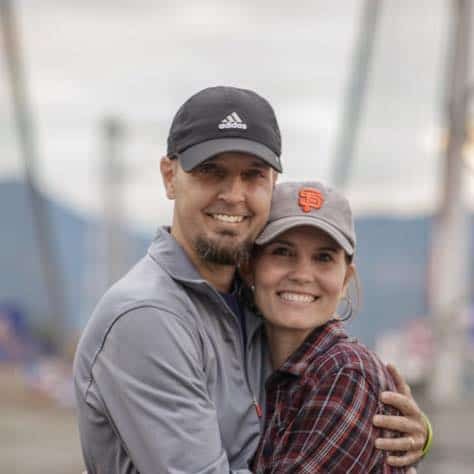 But we ended up spending so much time in the city and not a lot of time at the RV park, that we did not have to move the rig and empty our tanks until we were leaving the park. As far as showers and bathrooms, they’re not bad at all and were kept clean. Each restroom had six showers and four toilet stalls. There’s not a pool or game room, but we were so busy exploring the area that we didn’t miss those kinds of amenities. As far as noise, there wasn’t any! We heard an airplane and the ferry horn every once in a while, but that was it. Believe it or not, it was really quite peaceful. We stood outside our RV on the evening of the summer solstice and watched a beautiful sunset fill the sky on one side of the park as the Statue of Liberty stood serenely on the other side. We couldn’t have asked for anything more. If you have a dog, it’s such a nice place to take them on a walk. You can stroll along looking at the boats at the marina and the Statue of Liberty. Or stroll into Jersey City and eat at an outdoor cafe. It seemed like a very dog-friendly RV park and city, especially since in Jersey City the cute dogs outnumbered the humans. So feel free to bring your pooch along for the city experience. There really were dogs everywhere, both at the park and in the city. Let’s talk about the New York City subway situation. 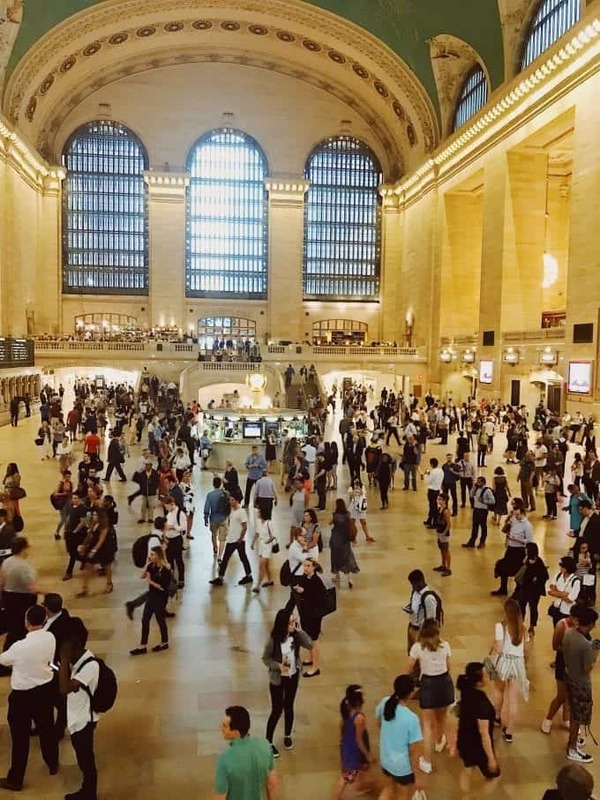 Grand Central Station – Can you spot our son Aaron? Our entire family has experience with public transportation, some more than others. Our daughter uses the public transportation quite a bit in her college town and she just naturally gets it. Todd and I lived in Europe for a bit and that’s how we got around. But New York City intimidated me a bit. Plus, I had never heard anything good about their subway system. Between hearing that it’s dirty and it smells bad and bad things happen, etc, etc, I was dreading it a little. Todd and I took a business trip to New York City a while back, but we only rode the subway a couple of times. But guess what? It wasn’t dirty. It didn’t smell bad. And while bad things do happen, like they do in any large city, our experience was a good one. It’s funny how you form your own opinion of something before you even personally experience it which can create irrational fears that shape your life and can make you miss out on great experiences. So what I’m trying to say is to not be scared of the subway. My daughter and I even went into the city alone one day and had no troubles at all. 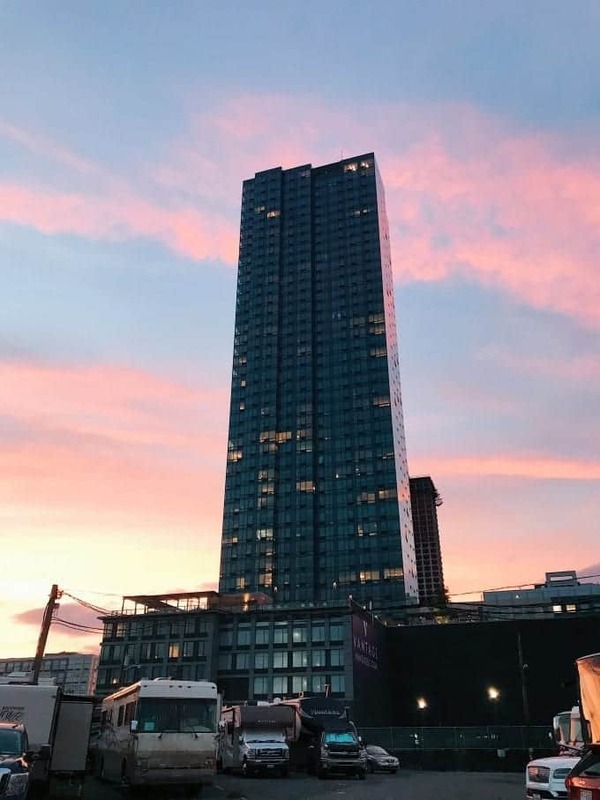 The closest station to the RV park is about 10 minutes away by foot in Jersey City. It’s the Grove St. PATH subway station which can take you up to 33rd Street and 6th Avenue (near Times Square) or to the World Trade Center site just across the river. Manhattan is just a 10-minute subway ride away! WARNING: Read this BEFORE you purchase a subway pass! There are two different rail systems that you will need to use if you are staying across the Hudson River from NYC in Jersey City (at this RV park or elsewhere). The PATH rail system takes you from Jersey City into NYC, but the MetroRail system is what you will use to primarily get around and see things in the city (on Manhattan Island, Brooklyn, etc.). Because of this two-system setup, the ONLY reasonable option you have as a short-term visitor to the city is to purchase a Pay-Per-Ride MetroCard at one of the kiosks located in each subway station. Each ride will cost $2.75 with this option. Note: If you are actually staying in NYC, the 7-Day Unlimited MetroCard may be the right option for you if you plan to be moving around quite a bit to fully explore the city. Luckily, one of the RV park employees helped to clear things up for me when I started asking questions about subway ticket options. You see, if I had purchased the 7-Day Unlimited pass, I would still have had to also purchase a separate Pay-Per-Ride MetroCard and pay $2.75 each way to ride the PATH into and out of the city (across the Hudson River)…and that was probably over half of our spending. Bottom line: You CANNOT use the Unlimited Passes (7-Day or 30-Day) on the PATH rail system that connects Jersey City with Manhattan. So you would be wasting a LOT of money if you go that route. I hope that helps you avoid a costly mistake if you make a trip to this area and stay across the river in New Jersey. I was very grateful for the friendly advice from the RV park employee, that’s for sure! Now, if you don’t want to take the subway to get into the city and deal with that craziness, there is another option. We just can’t speak to what it’s like. You can take the ferry into the city. The ferry picks you up just across the parking lot from the RV park, so it’s even more convenient. But it’s also more expensive, as you might expect. If you choose this option, you will still have plenty of spending on subways in the MetroRail system to get around Manhattan. Even after spending five nights at this RV Park, I could have stayed longer. Just writing about it is making me want to go back! If you’re wanting to have a true New York City RVing experience, we highly recommend Liberty Harbor RV Park. Just tell them Todd and Julie sent you! Just kidding, they’ll have no idea who you’re talking about.